Here is a link to various sizes. There should not be any color in the background. So the black you see should be clear in the real pic. logo variations for slacko pup. Here is a fixed version with the glow not cut off at the bottom. One thing.. the "S" (in eyeball) is a bit too close to the official Slackware logo, they have copyright on it and apart from that I don't want to upset Patrick Volkerding (Slackware founder/maintainer/benevolent dictator) or any of his developers. I don't think they have copyright on the font or the underline with the right angle vertical line. I will be emailing Patrick soon, before Slacko's release, just as a courtesy. Thanks for the info micko. Shall I remove until there is definative word on the eyeball S? Let me know I dont want to get any1 or the forum into trouble. Thanks glad you like the work. Most of it was already done with the pup logo I just added some extras. Leave your images there. I'm sure it's ok to use them for personal use. I just cant redistribute them, or use them as promotion for Slacko. One without the hanging text. About the "S", looks suggestive of $ (money). Puppy user since Oct 2004. Want FreeOffice? Get the sfs (English only). Here's a very simple one there are transparent pngs flat and with drop shadow and one wallpaper attached. 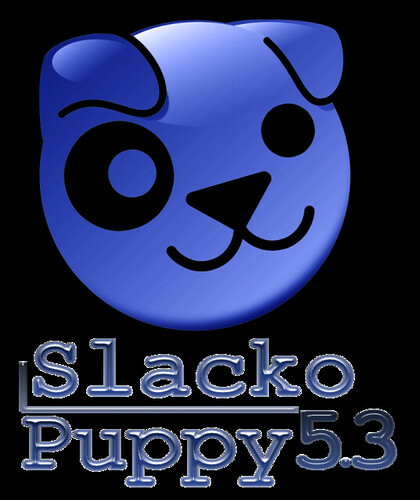 How about using an already made logo for the slacko puppy5,3. A few with different logos.